Got a gaming question? Ask the Game Master to make a ruling, provide advice or referee your gaming troubles. Send your questions to critforbrains@gmail.com. This week, we’re talking about meth and orcs. 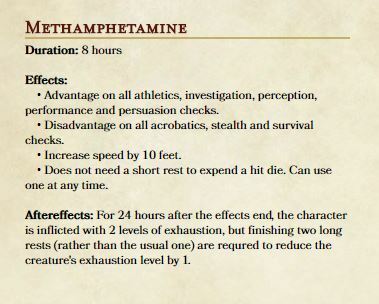 One of my players wants his character to do meth, or at least an in-game version of it. What effects should the drug have on him? What exactly is this guy playing? A rogue bard who’s also addicted to speed? That’s a really crazy choice. But that’s not your question. So hopefully your player can play up those things in his roleplaying. Harsh? Definitely. But meth is a helluva drug. It gives great benefits when you’re on it (being very alert, charismatic, fast and resilient), but it freaking destroys you afterward (that exhaustion could be devastating to a character). Let us know if you use that in a game. I’m getting tired of goblins, orcs and kobolds in early levels of my campaigns, but every adventure seems to have them as standard enemies. Other ideas for common enemies one might encounter in levels one to five? I kind of love orcs, and I enjoy putting them in my homebrew stuff. But yeah, I get it. Every one of us has slain enough goblins and orcs to feel OK about never having to face them again. Your standard orc, goblin and kobold has a challenge raiting between 1/8 and 1/2, so that’s hwere you should start. Sub in any monster with a similar challenge rating, and you should be good to go. That means giant crabs, poisonus snakes and stirges are good subs for kobolds. Blink dogs, flying swords, giant wolf spiders, pseudodragons, zombies, wolves and most swarms are good subs for goblins. And crocodiles, deep gnomes, gnolls, gray oozes, hobgoblins, magmin, rust monsters, shadows, warhorse skeletons, worgs and bigger, more dangerous swarms are good subs for orcs. But you know what? Get creative. There’s nothing saying your players have to even fight monsters. Have them fight a group of NPCs (bandits, cultists, acolytes, drow, thugs, etc.) instead of monsters. Maybe there’s a rival adventuring party seeking the same artifact. Perhaps they run into a pack of rabid bears roaming the forest. Maybe there’s a spider infestation and groups of spider swarms, phase spiders and giant spiders are all over the place.